Item number 2590/4 from the MOA: University of British Columbia. 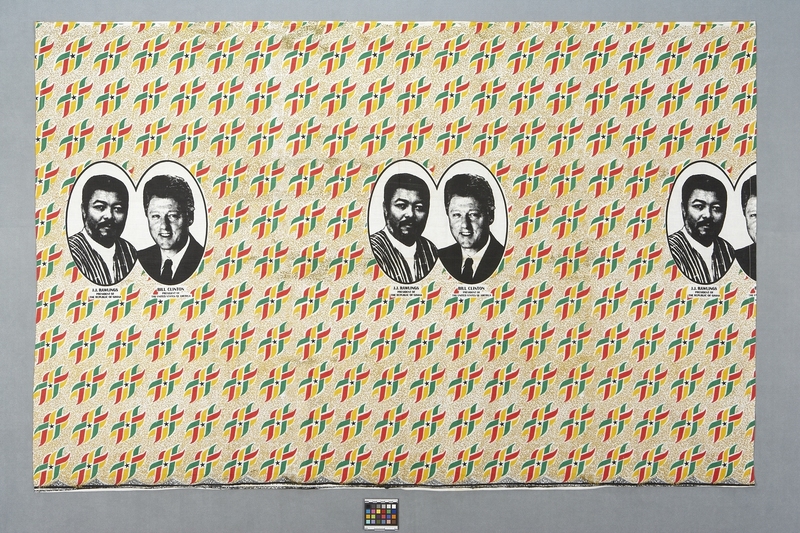 Large contemporary, commemorative cloth with a repeating pattern, consisting of images of the former President of Ghana, Jerry Rawlings, and Bill Clinton, then President of the USA. Each image is contained within ovals, which open to each other where they meet. Text written under each figure designates their name and rank. The rest of the pattern consists of the Ghanaian flag of red, yellow and green, intertwined with each other and set at a diagonal with a black star at the centre. The background consists of gold mottling. The bottom edge of the cloth has a horizontal black line with vertical black lines, which form small peaks. Cloth is thin with a slight stiffness. When US President Bill Clinton visited Ghana in 1998, a special cloth was printed to commemorate the occasion. Jerry Rawlings was the President of Ghana at the time, and he is featured on the cloth next to Clinton. The factory-printed cloths like this one commemorate or publicize special events. Consumers purchase the cloths and have them tailored into fashionable attire. Cloths are printed to commemorate a variety of events such as visits of dignitaries, funerals, university and church openings, the formation of women’s groups, beauty pageants, or New Year’s parties. Cloths may also be printed during and after elections to advertise political candidates. Some commemorative cloths are worn only for the special occasion for which the cloth was printed. The cloth is carefully stored away afterwards as a keepsake. Factory-printed cloth is a product of both African design and European technology. African people have worn this type of cloth for over 150 years. It was originally printed in factories in Europe and then marketed in Africa, but today most of the cloth is designed and printed in Africa.